Grand Voyager special edition | What Car? Chrysler is celebrating 25 years of the Grand Voyager by launching a special edition version called you guessed it 25th Anniversary. It will be priced at 32,600 - that's 1000 less than the Limited model - and just 100 will be available in the UK. Visual changes over the standard model include xenon headlamps, a new front bumper panel and chrome mesh grille, LED running lights and bespoke paintwork and badges. 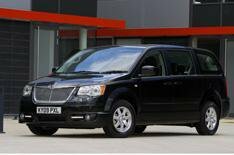 Interior luxuries include leather upholstery, a dual-screen rear-seat DVD system, satellite-navigation and Bluetooth. Power comes from a 2.8-litre diesel engine that delivers an average of 30.4mpg and CO2 emissions of 247g/km. A six-speed automatic gearbox comes as standard. The 25th Anniversary Grand Voyager is on sale now.